Drupal is right now one of the best Content Management Systems on the block due to its various special features that aid in hassle-free development of websites and web apps. Providing the benefits of Drupal Web Development to various clients, we, at Anjuinfotech.com have emerged as a top-notch solution provider. Drupal Development is favored as the system is open source, has a clear, well-documented API, better flexibility and more security. We can either incorporate a standard system or a customized one as per your needs for Drupal Development. 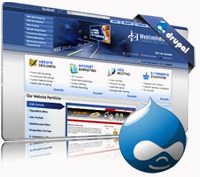 Why Choose Us for Drupal Website Development? Bringing a combination of advanced elements and cost benefits through Drupal Web Design for something as simple as content themes and display to complex mechanisms in authentication & authorization, we have become the right choice.